Abstract board games, sometimes referred to as "abstract strategy games", often test a player's planning, reasoning, and decision-making, usually in a one-on-one battle of skill. In the strictest sense, there is no "luck" in an abstract game – players succeed by plotting their moves and trying to anticipate their opponents' moves. Many of the world's classic board games, including Checkers, Chess, Go, and Mancala, are abstract board games. Players love these old games for their simple rules, rich history, and endless challenge. Don't let the simple appearance fool you. ABACAN is a fun new strategy game that uses simple rules to provide a depth of strategy that grows with the experience of the players. 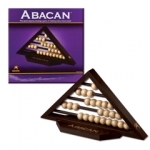 ABACAN is a variation of the nearly 3000 year old Chinese mathematical game of Nim. To play, players alternate turns sliding 1,2, or 3 beads on the same bar from one side of the game to the other. The winner is the player who forces their opponent to move the last bead. There is always a winner -- no ties, stalemates, or cat's games. Hand crafted from high quality hardwoods, ABACAN is pretty enough to be left out on the coffee table or bookshelf to be played again and again. Great gift item! In Abalone, you are literally trying to push your opponent over the edge! You'll face off against your opponent moving one, two, or three marbles at once. The more marbles you have in a column, the more weight you'll have to move a lighter column. You can move them one step in line or one step sideways. Tip a marble over the side-lines to get ahead. As you push the shining line of marbles, tipping your opponent's color over the edge one final time, you know you've won at Abalone! Abalone has sold over 4,000,000 copies and was the Mensa Select award winner in 1990. Once in a while a board game arrives that combines complete simplicity with brilliant game design. Welcome to Callisto, a seriously satisfying and undeniably simple game to learn but it's a game that uses strategic skills and a little luck to master. The object of the game is to be the player who successfully places the most tiles on the board; tiles must always be placed next to another tile of the same color. While placing your tiles you not only want to cover the most ground so you gain points, but you'll want to block the others from doing so too! ColorFever is a point-scoring game combining a perfect blend of strategy and chance. You draw tiles, roll the dice, and place your tiles accordingly. You score by building strings of tiles horizontally, vertically and diagonally. With every turn comes the chance to draw special tiles that give you extraordinary action! Add in the several additional ways to score using special tiles that add extra action and you are set for a heated game of action. Once you've played color fever, you'll want to play it again and again! A great two-player strategy game! Cover Up takes seconds to learn and minutes to play. Cover your opponent's options, while uncovering your plan to win. Four in a row wins the game! Reach new levels with Cover Up! Da Vinci's Challenge is the ancient game of secret symbols! This classic strategy game contains mysteries as old as the pyramids. The pattern of circles on the game board forms the ancient symbol called the Flower of Life, inscribed on Pyramid walls by the Egyptians over 6,000 years ago and studied in depth by Leonardo Da Vinci. The timeless symbol that has inspired artists and thinkers over the ages creates a playing surface that is both beautiful and intriguing. Players take turns placing game pieces on the board to form 9 different patterns. The more complex the pattern, the higher the point value. The player who scores the most points in the end wins! Prepare yourself for an epic battle with Dragon Face! The objective of this game is to force your opponent's Emperor to do an about-face. An intriguing blend of chess, checkers and Othello, Dragon Face is sure to become a new classic strategy game. The world is divided into 2 spheres with each vying to conquer the other by making them do an "about-face". The end goal is to capture the Emperor by locking it in. When you want a great strategy game to challenge the imagination, Dragon Face is it! Dvonn is a challenging stacking game with very simple rules. It is played with three red Dvonn pieces, 23 white pieces, and 23 black pieces. The players must try to control as many pieces as possible by building stacks, preferably by jumping on top of their opponent's pieces. While doing so, pieces and stacks must remain linked to the red Dvonn pieces. If not, they are out of the game. When no more moves can be made, each player put their stacks on top of each other. The player with the highest stack wins the game! This two-player family strategy game takes about 30 minutes to play. Eternas is a fun new 3-dimensional strategy game of four in a row. The rules and concepts are simple enough to appeal to kids from 6 to 96 yeas of age. But, don't let the simplicity fool you. While Eternas is quick and easy to learn, there is a depth of strategy that will keep you thinking. 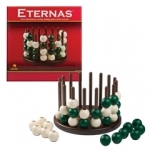 Eternas is a four-in-a-row style game in which the first player to place four bead of their color in a row, either vertically, horizontally or diagonally, wins the game. Conceived around the shape of the circle (the symbol for eternity) Eternas was designed for borderless play. With simple and straightforward rules, Exago is a fascinating family game. Each player starts out with 6 colored tiles (in 2 player games, each player gets 12 tiles). To win, you just need to be the first to place four of your hexagonal tiles on the grid in a straight line. Easy enough. But the challenge and strategy of good offensive and defensive tile placement becomes extremely obvious after just the first game. 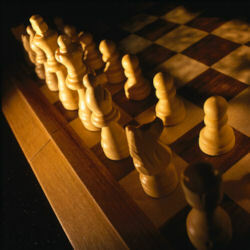 Each move requires planning for anticipated future moves such as in chess and other strategy games. Simply put, Exago is an fun and addictive game that everybody will want to play again and again! Fire and Ice is a Mystic Struggle for a Great Line of Power! This is a two-player abstract strategy game with a twist! Players actually place opponent's pieces as they move to gain control of the islands. Capture three islands in a row, by controlling three points in a row on each. Fire and Ice is a strategic, move-and-place game with shifting strategies, that increases in complexity until one player wins. There is a minimum of 9 moves each, and a maximum of 24 moves for each player. A new move gives depth and fluidity to this game of few rules, on a board of extraordinary symmetry. For two players, ages 8 and up. This quality wooden game is a Mensa Select award winner! Fits is basically multi-player board game version of the popular video game Tetris. One to four players try to skillfully fill in the spaces using shapes that are made up of three, four, or five blocks. Cards are drawn that tell the players which piece to use next. They then slide the piece down the inclined ramp to try to arrange the differently shaped tiles in the best way possible in order to obtain the most points. After four rounds, all points from the previous rounds are added up and the player with the most points wins! Fits is a fun family game that will puts everyone's spatial reasoning to the test. Hexover is a fun and fast-moving new strategy game of reversing momentum. Hexover takes a new twist on play pattern with roots dating back to England is the 19th century. The play pattern, which consists of trapping and flipping opponents disks, is familiar to people worldwide who have played Reversi or Othello. 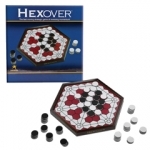 Hexover is a game of planning, positioning and rich strategy. The obvious move, may not be the best! The rules have been drafted so that there is always a winner, no ties, stalemates, or cat's games. Hand crafted from high quality hardwoods, Hexover is pretty enough to be left out on the coffee table or bookshelf to be played again and again. In Isolate players can experience the strategy of separation! Grab your color tiles, arrange them on the game board, and isolate your tiles first to win! Simple to learn, but challenging enough for experienced competitors. Isolate is perfect for the entire family! Contents of Isolate: 16 tiles, Gameboard, Instructions. Kulami is a fun, tactile game of strategy for two players. Ten wooden tiles are arranged to form an ever-changing board on which opponents compete to capture the largest number of tiles. Players take turns placing marbles so that each new marble must be placed horizontally or vertically in relation to the last marble played. By placing their marbles cleverly, players can limit their adversary's possible moves and gain the advantage to clinch the victory. High-quality wooden tiles and beautiful red and black marbles make for an eye-catching addition to any room, as well as hours of strategic gameplay for two players. ages 10 and up. Mensa Select award-winner. A great two-player strategy game! Mix Up takes seconds to learn and minutes to play. Get four in a row - one player goes for shapes, the other for colors. Upset your opponent's plan, while shaping your strategy to win. Ages 8 to adult. 2 players. 15-20 minutes per game. Molded plastic game board with parts storage. The aim of the game is to line up 4 of your balls in a row. But hold on a minute! A player cannot move a ball individually or with a ball of their own color. Moves MUST be made with an adjoining ball of their opponent's! The two balls are then moved together as a single unit, in any direction. Simple rules, intricate play. 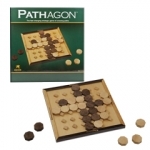 Pathagon is an exciting, ever-changing new strategy game of building paths. While Pathagon is quick and easy to learn, there is a depth of strategy that will keep you on your toes. Players take turns placing their wooden game pieces on the board in an attempt to build a path from one side of the game board to the other. There is a trapping move that allows a player to trap and remove one of their opponents game pieces from the board. The first player to complete the path wins. Sounds simple, doesn't it? The catch is that the two paths cross. Every move has an offensive and defensive consideration. Pathagon is simple enough to be played by children, strategic enough to engage a true gamer. Pillars of Plato is a great two player strategy game! It is easy to learn but hard to master. Start with all the pieces in the reservoirs and the poles clear. Players take turns placing one piece at a time on a pole, trying to line up four in a row of their own color. The line can be diagonal, horizontal or vertical. Four in a row wins the game! This lovely hardwood game would be at home on your coffee table or your desk. Pixel is an abstract strategy game where players try to get three in a row to win. Each player chooses a color and places a piece in the center of the game board then the sliders are lined up with the first players piece in the intersection. One slider is moved to create a new position for the intersection and you put your piece in that spot. Players then take turns moving only one of the sliders and places their pieces in the newly created intersections. If you manage to not set up your opponents' next move and get three in a row -- vertically, horizontally, or diagonally -- you win! A fun, cross-action game of strategy for the whole family. Quadefy is a fast playing new strategy game played in three dimensions. 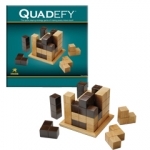 Easy to learn and quick to play, Quadefy uses visual spatial skills and strategies that will keep you on your toes. When playing Quadefy, you have to think a little bit strategist and a little bit puzzle builder. Players take turns stacking their game pieces on the base, each attempting to keep their entire game piece in bounds. In bounds means that the piece must be completely over the game base and no more than four cubes high. The first player to force their opponent to have to play out of bounds, wins. Every move is both offensive and defensive, making Quadefy very fun to play. Shift the Spheres to Form a Triangle in the Ruins of the Pyramids. 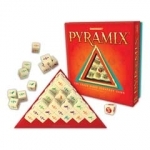 A fun and easy to learn game in which a winning triangle pattern is formed by moving balls along passages under the Great Pyramids. Quadtria is a casual, easily understood, yet compelling game, where strategy shifts like desert sand and a watchful initiative is essential. Quoridor is an award winning strategy game for two to four players! Move your wooden pawn across the board to the opposite side, as your opponent puts up wooden fence pieces, blocking your path. Can you get your pawn across and block your opponent from doing the same? The path is different each time you play! Quixo is a simple but not simplistic game, whose rules can be learned in just thirty seconds. Anyone can play! Line up 5 cubes in a row, pushing your lines of cubes horizontally or vertically. This is one of the few strategic games that can be played by 2 or 4 players (in teams). Quixo plays like a very advanced version of Tic Tac Toe where one tries to get five in a row. The game can be learned in a few minutes and moves along quickly. 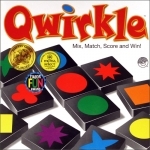 Qwirkle Cubes is a twist on the award winning game of Qwirkle. As in Qwirkel, players try to score points by building lines that share a common attribute - either a color or a shape. In Qwirkle Cubes however, players have more control over their hands because they can roll and re-roll their dice to try to get the shapes they need! Everyone can see what is in each others hands so players' offensive and defensive planning will change constantly. When you create a line, you score points for each cube in that line. If you add to an existing line, you score points for all cubes in that line as well. Complete a line of six cubes to make a Qwirkle and score six bonus points! The player with the highest score when all the cubes are used up wins the game. Originating from ancient China, Rolit is played with 2 to 4 players. Its ingeniously simple rules are easy to follow for anyone from age 7 and up, making Rolit an outstanding family game. Rolit is exciting and unpredictable because anything can happen at any stage. One well placed move can change the outcome of the game. The object is to block your opponents' playing pieces and capture them by rolling their colors over to your own; you win when you have the most playing pieces showing your color. This coffee table version of the classic Rush Hour game is packed with 155 challenges spanning five levels: Beginner to Grand Master. It is complete with a raised game board, parking spaces for the cars and trucks, a billboard to hold the challenge being played, a storage drawer for all the challenges and an exit ramp! The sleek, new look keeps players solving challenge after challenge in style! Escape! That's the goal. Rush Hour is a premier sliding block puzzle designed to challenge your sequential-thinking skills (and perhaps your traffic-officer aspirations as well)! The classic game of Ancient Egypt! The Senet board measures 16"x5" and features a drawer on one end for storing the playing pieces and the rules (included). Senet is an ancient Egyptian board game similar to backgammon. Each player has 5 pawns which travel around a 3 by 10 board in an S shaped path. Movement is dictated by the throw of 4 sticks (black on one side and white on the other) which can produce a 1,2,3,4, or 6, (5 is not possible) depending on how they land. As in backgammon, the objective is to bear all of one's pawns off first. Set Cubed offers the familiar game play and look of Set the card game in a dice format. Players try to connect their dice with those already on the game board to build SETs of like shapes, colors, or symbols. Bonus points on the board allow you to rack up points and Wild dice help you make SETs where they might otherwise not be possible. The more SETs you make up, down, and across the board, the higher you score! In Spy Wire, a ticking time bomb is seconds away from exploding and you've got to diffuse it before it blows! You'll need to think quick, and move your fingers fast to find the hidden parts to your opponent's bomb. Sliding the circuit-board tiles in all directions to create virtual connections will allow you to probe his devious device. Decoys are everywhere. But if you can manage to solve your opponent's puzzle and dismantle his bomb, you win! Unlock the power of your mind with Telepathy. This abstract strategy/puzzle-solving game combines deduction, logic, intuition, and more as you go head to head with the other players to see who can be the first to guess their opponent's secret square. Each Telepathy game board has nine colors and nine symbols spread throughout the eighteen rows and columns. On each turn your objective is to find out information about your opponent's secret square by making a guess and recording the response. Be the first player to determine your opponent's secret square to win Telepathy! If you like the games Sudoku, Mastermind, or Battleship, then you'll love Telepathy. Players lead nations in this new world where the most valuable resource is the land itself. The clever system of movement and boundary-building gives you the tools you need. However, it is your strategic vision which will ultimately decide whether or not you will rule Terra Nova. Contains game board, 88 border stones, 44 pioneer playing pieces, and 4 scoring counters. For 2-4 players. Ages 13 and up. If you love new twists on old classics, if you love games of strategy-planning and if you love controlling where your opponent can play... you will love Tic-Tac-Ku! It is a great and new adaptation of the old classic Tic Tac Toe! 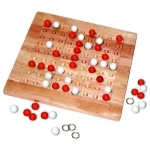 Tic-Tac-Ku is the durable wooden game that is full of strategy that really makes you use your marbles and much more! Tic-Tac-Ku is played on square board with nine 3 x 3 square playing zones. Each player controls where the other player must play. Tic-Tac-Ku involves a lot of skill and strategy in order to win. This simple and extremely exciting pattern recognition strategy game will have you outwit and trick your opponents with every move! Your goal is to build out as many geometric patterns to score points. But watch out, your opponents may try to block you to make their own Trangos, so place your pieces wisely, as the player with the most points, wins! Playing Trappex is little bit like reuniting with an old friend. While it is comforting rekindling childhood memories with the time tested Dots and Boxes play pattern, there is still something new and different how the game has grown up in the meantime. Even though Trappex is quick and easy to learn, there is a depth of strategy that will keep you alert from your first move till your last. To play, players take turns placing their wooden wall pieces on the board, attempting to complete squares while preventing their opponent from doing the same. The player with the most completed squares at the end of the game wins. 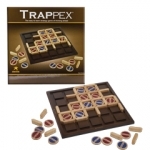 Trappex is simple enough to be played by children, strategic enough to engage a true gamer. Trapture is the game of connect, trap, and capture! Squiggle your way to victory with this tactical strategy game of connect and capture. Starting from the edges of the board, players take turns placing their Squiggles game pieces. Players crate Squiggle highways around the board, capturing pegs along the way. Surround a peg on at least four sides, and it's yours! Be tactical - a well-planned move can even capture two pegs at once. The player who 'traptures' the most pegs wins! Zertz is played with 5 white, 7 gray and 9 black marbles and 37 round tiles. The tiles are used to assemble the board; the marbles are in a pool. Each turn you must place one marble on the board and then remove a free tile. The aim is to capture 3 white, 4 gray, 5 black marbles or 2 marbles of each color. To capture you must jump with a marble over another marble. It sounds easy, but both players play with the same marbles and the board gets smaller with every move. Thus, the players are forced toward a situation where every move is a crucial one... when you create a trap for your opponent at the wrong moment, you may find yourself caught in the trap.